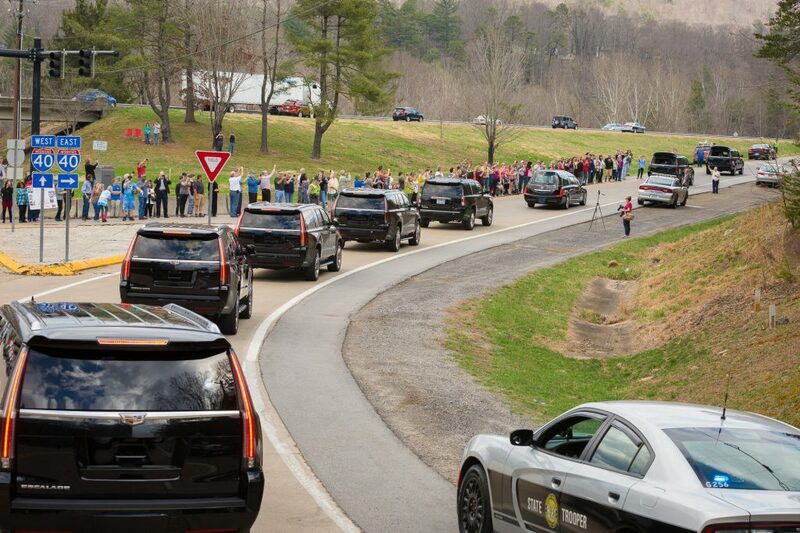 People lined up along the road as Billy Graham's hearse left the Billy Graham Training Center at The Cove in Asheville, N.C., on Saturday morning. On Saturday morning, Billy Graham’s casket left the Billy Graham Training Center at The Cove in Asheville, North Carolina, and made its way toward the Billy Graham Library in his hometown of Charlotte. The motorcade took about three-and-a-half hours to make the 130-mile journey from the mountains to the city, traveling along I-40 East, U.S.-321 South and I-85 North. Crowds of people lined the streets as the motorcade passed through Black Mountain shortly after departing from The Cove. The hearse traveled up State Street between Craigmont Road and I-40. It passed Town Hardware, formerly Black Mountain Drugstore, a place Billy and Ruth Graham used to frequent. Billy Graham often rode his horse there from his home in Montreat just a couple of miles away. Just behind Town Hardware, Cherry Street dead-ends at the railroad tracks where the Black Mountain train station used to be. In the 1950s, Billy often boarded trains to Washington or New York at the Black Mountain train station, then flew out from one of those cities to preach internationally. 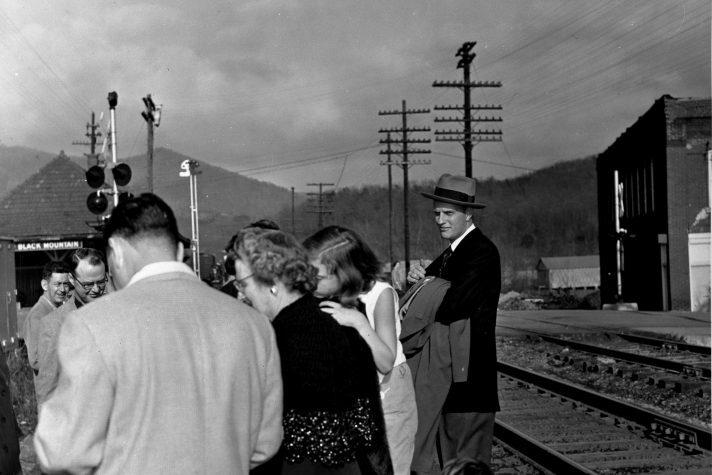 Billy Graham at the Black Mountain train station, which the motorcade passed on Saturday. He often took the train to bigger cities where he would then board a plane to make a preaching engagement. Around 2:20 p.m., the motorcade arrived in Charlotte and went through uptown before reaching the Billy Graham Library. The motorcade passed another notable site at the intersection of South Boulevard and West Boulevard. The vehicles paused briefly in front of Grace Covenant Church, formerly Chalmers Memorial Associate Reformed Presbyterian Church, which was five miles from Billy Graham’s childhood home. Billy Graham and his family were members of this church during his childhood and teen years. Church bells rang out as the hearse stopped there. 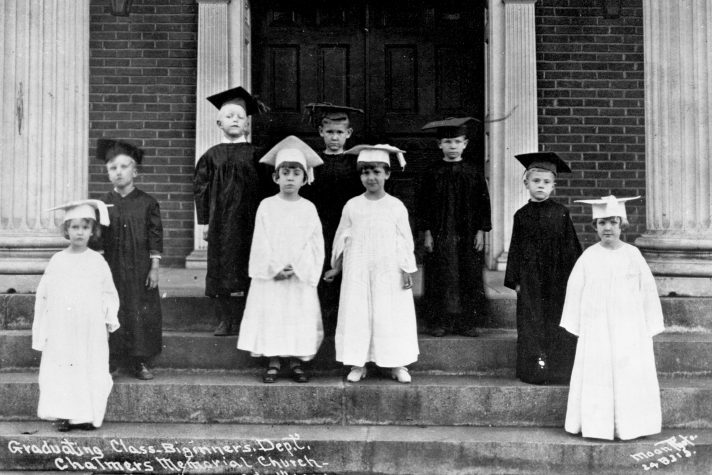 Billy Graham, second from left, graduating from the beginners department of Chalmers Memorial Church in Charlotte, North Carolina, on Oct. 1, 1924. The motorcade will pass what’s now known as Grace Covenant Church. Billy Graham will lie in repose at the Billy Graham Homeplace, on the grounds of the Billy Graham Library in Charlotte, on Monday and Tuesday, Feb. 26-27. He will lie in honor at the U.S. Capitol Rotunda in Washington, D.C., on Wednesday and Thursday, Feb. 28 and March 1. A private funeral service will be held on Friday, March 2, in Charlotte. Billy Graham will be buried beside his wife, Ruth, in the Prayer Garden at the Billy Graham Library. Watch continuous streaming coverage of Billy Graham’s life and legacy.